Is safe, legal medical marijuana use finally becoming reality for seriously ill New Mexicans who have state approval for use of the drug? A raft of changes at the state and federal level seems to indicate that medical use of marijuana is growing closer to consistent government support every day. And that’s good, because it’s never made sense that even though medical marijuana use is legal, many New Mexico patients still fear eviction, harassment and even arrest and prosecution when trying to use, grow or otherwise procure their medicine. Medical marijuana has been legal in New Mexico since 2007, when the Legislature passed a law authorizing its use for people with chronic debilitating or terminal conditions such as cancer, HIV/AIDS or multiple sclerosis. A total of 13 states have legalized the use of marijuana for serious medical conditions, including Michigan, which just approved it in 2008. A MAN has been charged after police raids on four western Sydney homes uncovered 780 cannabis plants worth more than $2.1 million. Homes at Blacktown, Prospect, Seven Hills and Northmead were raided just after 7am (AEST), with officers finding sophisticated hydroponic cannabis set-ups in each house, police said. Police allegedly uncovered 290 plants at the Blacktown address, 114 plants at Prospect, 185 at Seven Hills and 191 plants at the Northmead home. Houses built out of hemp instead of traditional building materials leave a ‘better than zero carbon’ footprint, according to new research out of the UK. Aside from helping to combat global warming, building homes from the cannabis plant could also give a boost to struggling rural economies. That’s good news almost everywhere except for within the U.S., where industrialized hemp is still illegal to grow under federal law. The process for constructing the carbon neutral building material is a unique one which uses lime-based adhesive to bind together hemp fibers. Homes built from the hemp-lime material can reach carbon neutrality in large part due to the remarkable efficiency by which the fast growing hemp plant can store carbon as it grows. The lime adhesive is also important due to its powerful insulating properties. A quantity of 2.6 tonnes of cannabis was seized in a boat near ‘Sbiâât’ beach in Ain Temouchent, 480 km west of Algiers, by the Algerian police, said Monday the gendarmerie. The drugs were concealed in packages bearing the words ‘KS2009’ according to a communiqué of the police quoted by the Algerian APS agency. The US Government’s Substance Abuse and Mental Health Data Archive (SAMHDA) is a treasure trove of information from the National Surveys on Drug Use & Health 2001-2007. I’ve always been uncomfortable discussing most marijuana statistics from this and other reports because the data so often cover marijuana use from age 12 and older. NORML stands for the responsible adult use of marijuana, so I wanted to know the facts on age 18 and older (some may wish for numbers age 21 and older; I only picked 18+ because the first data column is age 18-25). The essential caveat: these are the people who will tell these things to a stranger for a government survey. First of all, how many adults in the United States have ever smoked weed? The Survey breaks down the data by age categories and gives the percentage of the sample (Unweighted N) that answered yes or no to the question. Then they extrapolate, based on US adult population demographics, how many people in the United States (Weighted N) would answer yes or no. Who Wants To Pay Taxes? Cannabis Consumers Do! This coming Tax Day, April 15, millions of Americans lament paying their state and federal income taxes. This particular Tax Day, there are hundreds of organized 'Tea Parties' where citizens will actually protest paying income taxes by dumping tea into local bodies of water (apparently inspired by CNBC's Rick Santelli's recent rant advocating such). However, what group of citizens in America are standing before the government and media, jumping up and down, effectively begging to be taxed? The estimated 35-40 million cannabis consumers, joined by non-consuming anti-prohibitionists, are calling on the government this Wednesday, Tax Day, to end 70-years of a failed prohibition, and replace it with logical alternatives to prohibition--such as actually controlling cannabis production, sales and use via taxation. A club for cannabis smokers has been openly flouting the law for months, with hundreds of people a night turning up to buy and smoke dope. The "Daktory" has been operating from an Auckland warehouse since November and boasts having 400 people on a busy night. Those behind the scheme are involved in efforts to have the drug decriminalised, and say they accept arrest by police is a possible outcome of their provocative club. When I first interviewed Assemblymember Tom Ammiano’s press representative, Quintin Mecke, about Assembly Bill 390—the measure that would legalize, regulate and tax marijuana in California, the spokesman seemed optimistic that the Obama administration represents a real possibility that the United States is poised to adopt more humane and reasonable drug policies. “If you see Attorney General Holder’s comments and the federal government with a clear shift about its approach—first to medical marijuana—that certainly leaves the door open for consideration about marijuana in general,” Mecke told me, but at the time I voiced skepticism about Obama’s intentions. Isn’t Obama going out of his way to cater to a conservative crowd? Mecke responded by recalling Obama’s accounts on the campaign trail of his mother who had used cannabis while undergoing treatment for cancer. The implication was that since he had personal experience with marijuana’s efficacy, he and his administration would be more sympathetic, which is reasonable. Gulf Onshore Announces Name Change to Cannabis Science, Inc.
Gulf Onshore Inc (OTCBB: GFON) has changed its name to Cannabis Science, Inc., reflecting its new business mission, and has requested a new stock trading symbol, which will be will be assigned by NASDAQ OMX in the near future. Cannabis Science Inc. has also launched its new website www.cannabisscience.com reflecting its new name. The Company’s first pharmaceutical cannabis product for DHHS- and FDA-qualified testing will be a whole-cannabis extract in the form of a lozenge. The Company has applied for its DEA handling license and is interviewing researchers to complete and sponsor its IND (Investigational New Drug) test protocols. The lozenge is a part of the assets and know-how developed by Steven W. Kubby and Dr. Robert J. Melamede and acquired by the Company from Cannex Therapeutics of California. Busselton police have seized 800 cannabis plants and large quantities of the dried drug in the latest phase of a six-month operation that has already found 6000 plants hidden deep in forests in the South-West. Three men have been arrested after five raids this week in Busselton, Cowaramup and Margaret River. A man in his late 20s was expected to be charged last night after police seized large quantities of cannabis from a Busselton home yesterday. Waylett was pulled over last week while driving in an Audi car in Westminster, central London, by police who believed he was behaving suspiciously. A search of the car allegedly revealed eight bags of suspected cannabis, and Waylett and a friend, both 19, were arrested on suspicion of drug possession and taken to a nearby police station. The actor's home in Camden, north London, which he shares with his mother, Theresa, two brothers and a sister, was then raided and police allegedly seized ten mature cannabis plants valued at around £2,000. Where did the word ‘marijuana” come from? In the mid 1930s, the “m-word” was created to tarnish the good image and phenomenal history of the hemp plant. From 1921 to 1932 Andrew Mellon was the treasurer and Dupont paint’s primary investor. He appointed his future nephew-in-law, Harry Anslinger, to head the Federal Bureau of Narcotics and Dangerous Drugs. Secret meetings were held by these financial tycoons. Hemp was declared dangerous and a threat to their billion dollar enterprises. For their dynasties to remain intact, hemp had to go. These men took an obscure Mexican slang word, “marihuana,” and pushed it into the consciousness of America. Scientists have isolated and identified nine new cannabinoids that have antifungal, anibacterial, and a variety of other biological activities. MORE than $18 million worth of cannabis crops have been seized in a series of aerial drug raids across NSW over the past five months, police said. The haul had effectively wiped out a large percentage of the NSW summer crop, which would otherwise have now been on the streets of Sydney and NSW country towns. But the increase in police aerial patrols since September last year had now forced dope growers, literally, into the hills. Police fear crops would become harder to detect with growers moving to more rugged and inaccessible terrain, using sophisticated irrigation systems. A field poll commissioned by Oaksterdam University between March 16th and March 21st shows for the first time a majority of California voters are in favor of taxing and regulating adult cannabis consumption similar to alcohol. 54% of those polled believed cannabis should be legal for adults while 39% are opposed and 7% are undecided. A majority of voters indicated they would vote for a measure to allow cities and counties the option to tax and regulate cannabis and make adult cannabis consumption legal (53% Support/41% Do Not Support/7% Undecided) The economic benefits of taxing cannabis persuaded many voters to support the proposed ballot initiative. Re: Marijuana in a pill, March 30. Letter-writer Heather J. Martelock is mistaken. The "pills" that allegedly contain marijuana contain only a synthetic mimic of marijuana, but no actual cannabis. The only medicine in the world that contains actual cannabis is Sativex from GW Pharmaceuticals/Bayer. This sublingual spray has been a disappointment for being made from only a single strain of cannabis. It is only prescribed in Canada for multiple sclerosis (MS). Its value is very limited. Great Granny Dawn Danby's dope dealing could see her kicked out of the same house she's been sentenced to serve home detention in. On Friday the 71-year-old was sentenced at Tauranga District Court to a year's home detention and 300 hours community work on charges of growing, selling and possessing cannabis for supply between October 2006 and February 2007. Now police want to take her Paeroa home a cute hillside house surrounded by well-kept gardens and littered with pot-plants which Danby says was bought legitimately and has been mortgage-free for more than 15 years. Contrary to what is often claimed by supporters of the tolerant Dutch drugs policy, cannabis usage by young people in the Netherlands is not lower but actually higher than average in Europe, it emerges from the European School Survey on Alcohol and Other Drugs (ESPAD) over the year 2007. On usage of cannabis, the Netherlands scores above the European average. Over one-quarter (28 percent) of the youngsters aged 15 and 16 surveyed said they have used cannabis sometime in their life, compared with an average of 19 percent in Europe. Current cannabis usage (at least once in the month prior to the survey) is more than double the European average in the Netherlands (15 versus 7 percent). The Netherlands has risen in the ranking order of 35 European countries from number 12 in 2003 to number 5 on recent cannabis usage. This is due on the one hand to a 2 percentage point increase from 2003 (13 percent) and on the other, to a reduction in a number of countries that scored worse than the Netherlands in 2003, including France (from 22 to 15 percent) and England (from 20 to 11 percent). Organizers of Michigan's 38th annual Ann Arbor Hash Bash said this year's event falls on the same day the state's medical marijuana law takes effect. Adam Brook of Detroit, who is acting as emcee for the event for the 19th time, said medical marijuana will be a hot topic at the cannabis smoking event Saturday, The Ann Arbor News reported Friday. "The Hash Bash started as a smoke-in, and really is a smoke-in," Brook said. "However, speakers take on current political (questions) of the day. 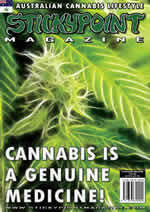 This year, it's medical marijuana." Carlos Santanta has urged President Barack Obama to legalise cannabis. The 61-year-old guitar legend believes that by making the drug legal, it could transform the flagging American economy. Speaking at the promotional launch of his Hard Rock Hotel residency in Las Vegas, Santana used the platform to spread his views on the contentious subject. About 1 million Americans are in jail or prison for just smoking cannabis. It costs about $40 thousand a year to keep them in jail. Each one could be earning about $20 thousand a year and paying taxes. This really is crazy. (MOLALLA, Ore.) - Instead of writing this to the President, I direct it to a kanaka connoisseur of maui wowie and kona gold with some knowledge of the Hawaiian panoles who found no dangerous/harmful effects and used it as a tranquilizer/stimulant. The U.S. Govt. estimates that about 90 million people have used cannabis and found it is not harmful and only slightly habit forming. They enjoy the effects. About 400 thousand Americans use it legally in 13 states with great medical benefits.